Old washers are completely dismantled, and are sand blasted. The bad metal is replaced, and the washer is powder coated. New pumps, plumbing, and electrical controls are installed. 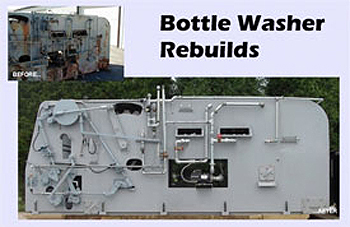 When the washer leaves our shop, it is ready for years of reliable service. We have rebuilt many of the common brands of washers! Washers come in varying configurations. Some have automatic in feed, and a pre rinse station. Others are a more simple design. Washers come in 4-wide,6-wide,8-wide, and even wider sizes.